Mary Poppins is back, y'all. Disney recently released the first teaser trailer for the highly-anticipated Mary Poppins Returns, which stars Emily Blunt as the famed, magical nanny in the role that was originated by the legendary Julie Andrews. She looks absolutely perfect in the trailer as Mary Poppins, but you know what makes it even better? 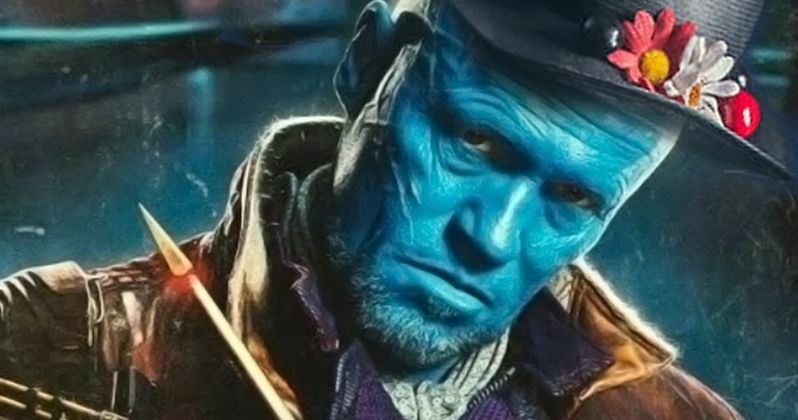 Replacing Mary Poppins with Yondu from Guardians of the Galaxy Vol. 2, as evidenced by this fan trailer. This fan trailer doesn't utilize the entire Mary Poppins Returns teaser trailer. Just the bit that really counts. We see Lin-Manuel Miranda flying a kite in a storm and when the clouds open up, instead of seeing Emily Blunt, we see Michael Rooker's Yondu, who drops his instantly classic line, "I'm Mary Poppins, Y'all." It makes the look on Lin-Manuel Miranda's face a little more priceless. Not for nothing, but Disney owns Guardians of the Galaxy and the Mary Poppins movies. So they could make this happen if they really wanted to. The surely don't, but they could. Maybe Thanos can mess around with the Reality Stone a bit and make this happen come time for Avengers: Infinity War. One can dream. Michael Rooker has fully embraced the love fans have for the line from Guardians of the Galaxy Vol. 2. He even had "Mary Poppins" on his San Diego Comic-Con badge last year. Yondu's time came to a heroic end in the Marvel Cinematic Universe in the last movie. He died rather tragically in order to save Star-Lord's life. Prior to his death, he was seen floating down slowly toward the ground near the end of the movie, at which point Peter Quill told him that he looked like Mary Poppins. Yondu, having no idea who that is, decided it was a pretty great honor and declared, "I'm Mary Poppins, y'all!" As for the actual movie that's coming our wary later this year, Mary Poppins 2 is set in 1930s depression-era London, which is when author P.L. Travers' original books take place. The movie will be taking inspiration from those books and explore material not explored in the original Mary Poppins movie. Michael (Ben Whishaw) and Jane (Emily Mortimer) are now grown up, with Michael and his family living on Cherry Tree Lane. Following a personal loss, the magical nanny re-enters, or returns, if you will, to the life of the Banks family. She uses her unique magical skills to help the family rediscover the joy and wonder that's missing in their lives. If you want to see Mary Poppins returns in its actual form without Yondu, the movie is set for release on December 25. If you want to see Yondu deliver the classic line, Guardians of the Galaxy Vol. 2 is streaming on Netflix. If you want to see the two things mashed together in true internet harmony, you can check out the fan made Mary Poppins Returns trailer, courtesy of the Meme Detective YouTube channel, for yourself below.